Others worked at Moores Creek National Battlefield. 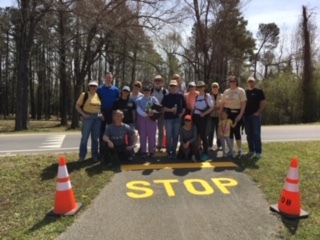 We held an abbreviated workday there, as the park was able to get more work done prior to the Gathering than they expected due to overwhelming volunteer help by the local community. 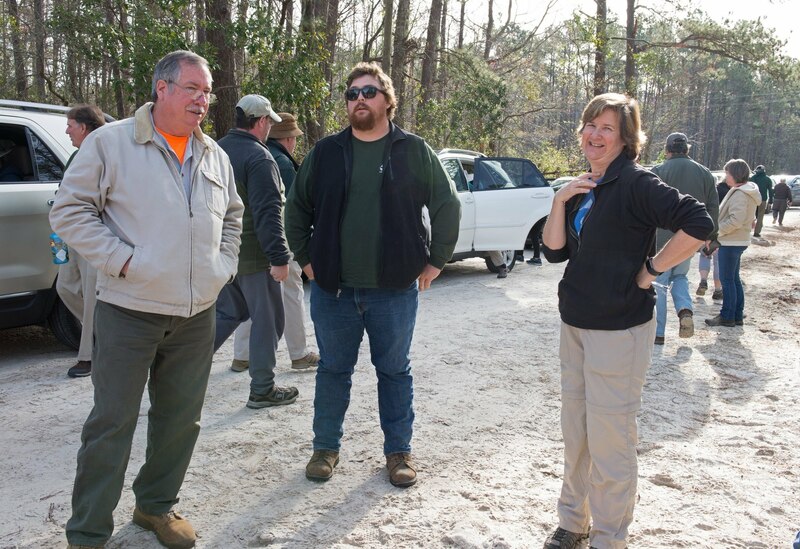 Volunteers helped the rangers, then had lunch, and were treated to a tour led by Judy Switzer, a board member of the Moores Creek Battlefield Association. 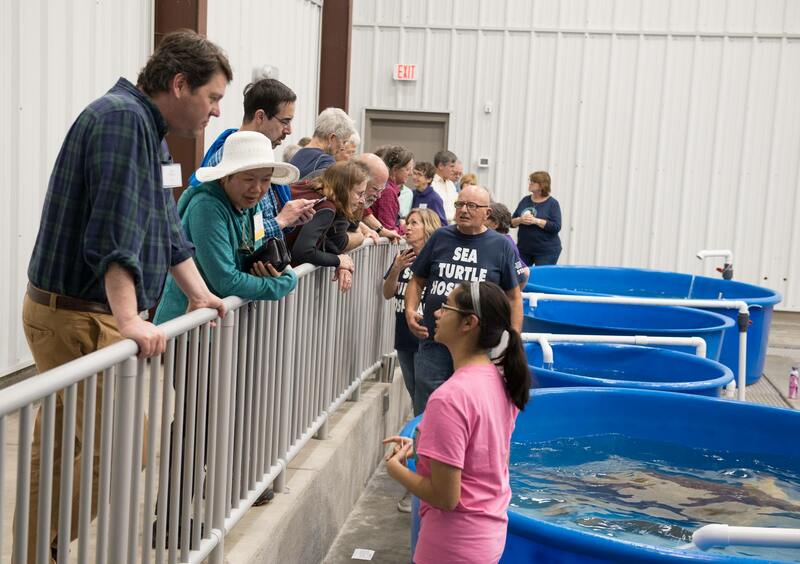 The whole group came together for the first time at the Karen Beasley Sea Turtle Rescue and Rehabilitation Center for a warm reception, tour and time with director Jean Beasley. Many folks hung outside and enjoyed toasting Friends and the beautiful day before moving inside the center. Hospital volunteers, both local and visiting students from the University of Maryland, led us through the Center, sharing about the turtles and their rehabilitation challenges. After a stop at the appetizer station, we moved on into the main room to see all the largest turtles – a great treat! We then wandered over to the Surf City Community Center for an abundant buffet dinner provided by our hosts, and time to chat with our new and old Friends. 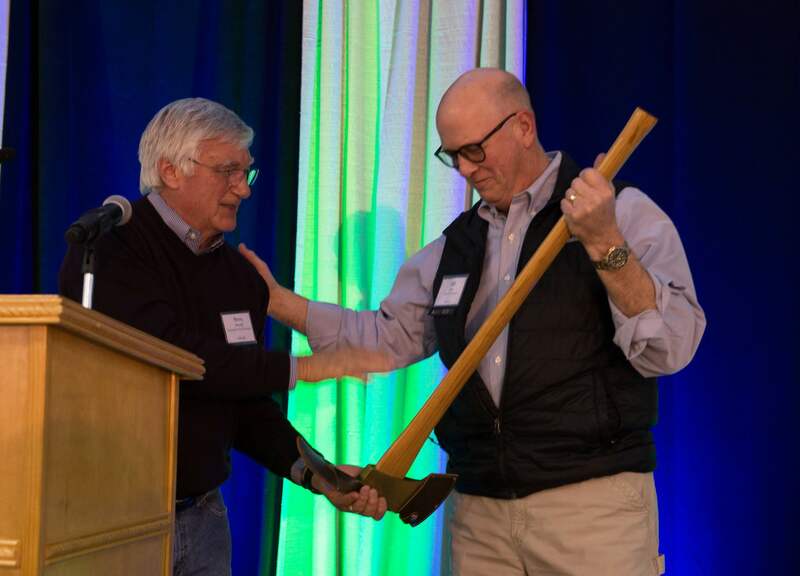 A short program featured the “passing of the Golden Pulaski,” from Steve Metcalf to Bill Scott, our way of recognizing the peaceful transfer of power from outgoing president to the current president of Friends. George Brown, the Chair of Pender County Commissioners, share a welcome from the locals. 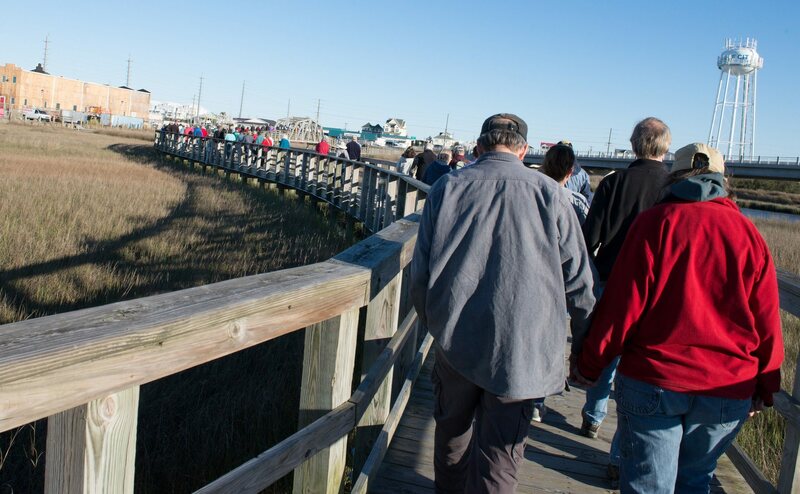 Mayor Medlin, who received a hand-carved hiking stick from previous Gathering hosts in Elkin, assured everyone that the stick was one of the first items that was taken off the island in preparations for Hurricane Florence’s arrival. We closed out the dinner with a great raffle off useful hiking items from AntiGravityGear. Many folks hiked over to the Salty Turtle for a night cap. Saturday was a clone of Friday, so we’re thankful people opted to attend the membership meeting instead of playing hooky to take advantage of such a gorgeous day. Our hosts provided a bountiful breakfast spread, so we were all well fed before sitting down for the meeting. 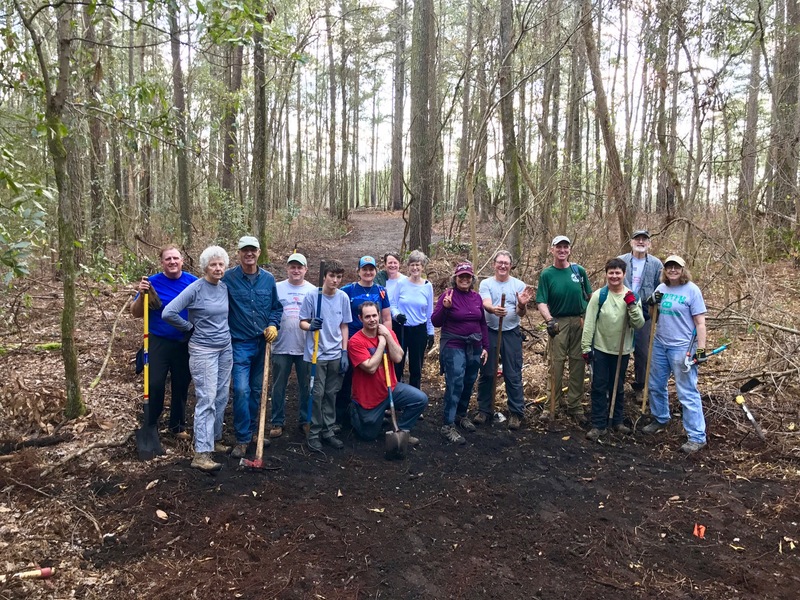 Welcomes were made, and we got right down to business with an update on NC State Parks by new director, Dwayne Patterson. 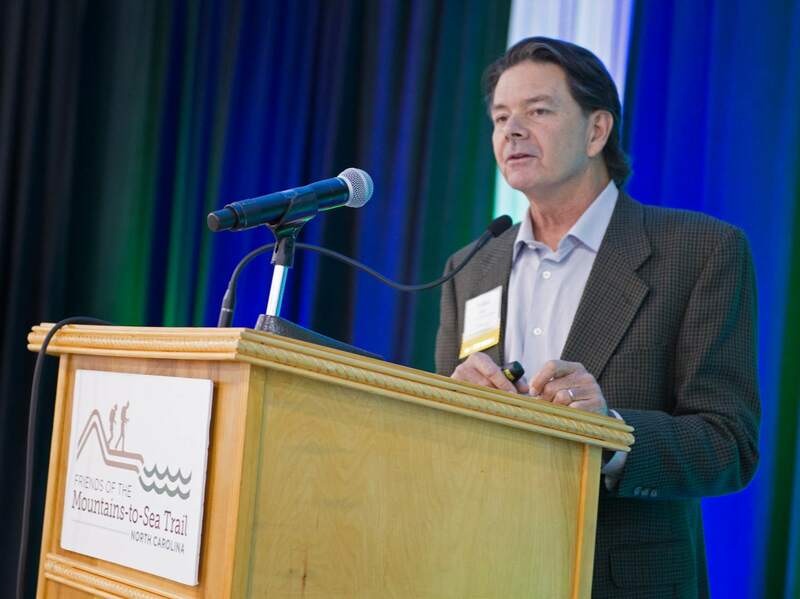 Director Patterson shared the state of the parks, including challenges faced, but more excitingly his dreams for getting more school children into parks again. Kate Dixon, Friends’ executive director, followed with a look at an overview of what’s happening on the MST. Click here to view Kate’s presentation. 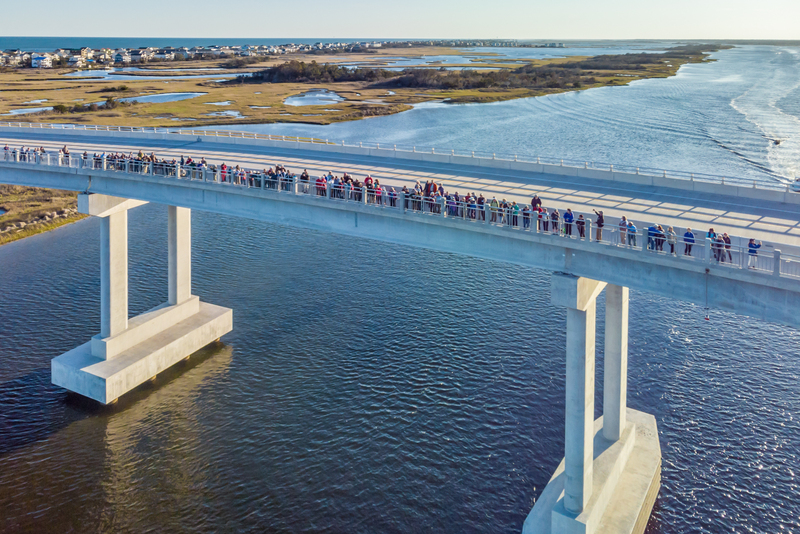 Ben Jones, our Coastal Crescent project manager, followed with a report about the work he is doing in key locations on the eastern part of the trail. Specifically, he shared about a project in the planning stages in Holly Shelter Gamelands, part of the MST quite near Surf City. 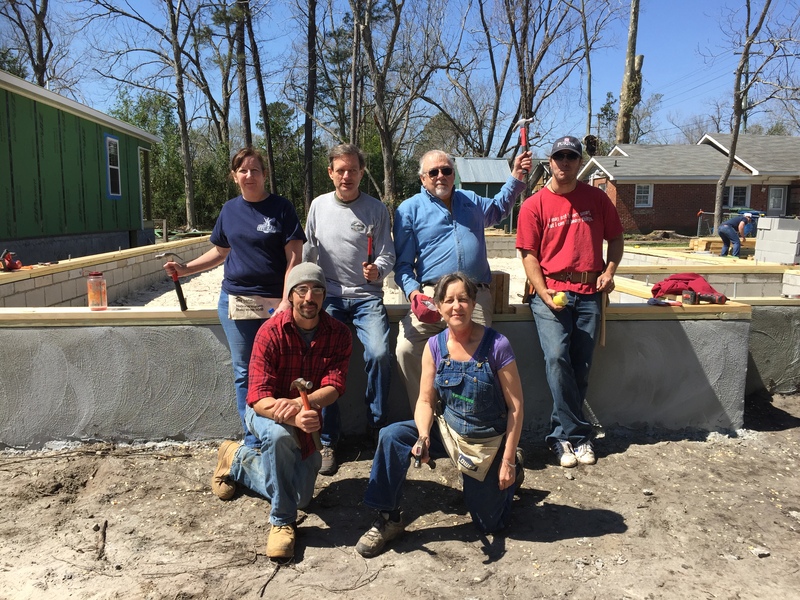 Thanks to Duke Energy Foundation for its generous grant to support his work. Friends’ treasurer, Marcia Bromberg, also gave a financial report, stating that Friends is in good financial shape. Click here for a look at Marcia’s presentation. 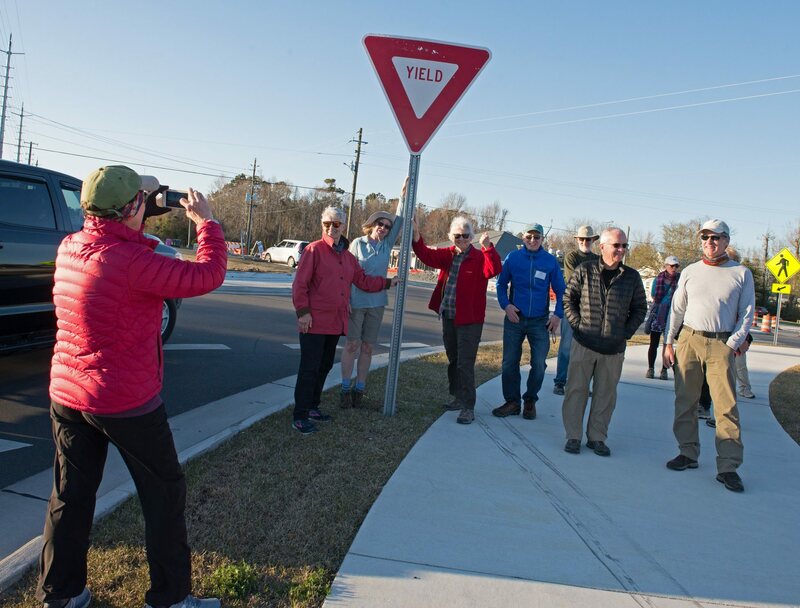 Our keynote speaker, Walker Golder, the director of the Audubon Atlantic Flyway Coast Initiative, gave an engaging talk about the health of the Cape Fear Arch including great images of the birds seen throughout the area. While he acknowledged that climate change is happening, one member suggested that his overall tone of optimism was encouraging. 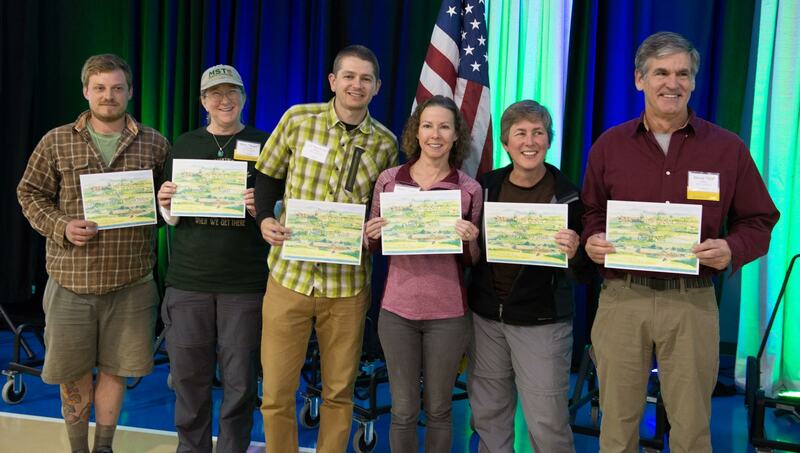 After a quick lunch and time mingling with folks from Great Outdoor Provision Company, REI and AntiGravityGear, we celebrated our 75-hour and 250-hour volunteers with some hooting and hollering led by board member Les Love and State Parks director Dwayne Patterson. Next we honored our Class of 2018 completers in attendance: Jack Rabbit, Angel, Sketchy Guy, Latte, Beerdra, and S2S (aka Danny Wilcox, Mary Stewart, Jeff and Debra Rezeli, Deirdra Smith and David Nutt). 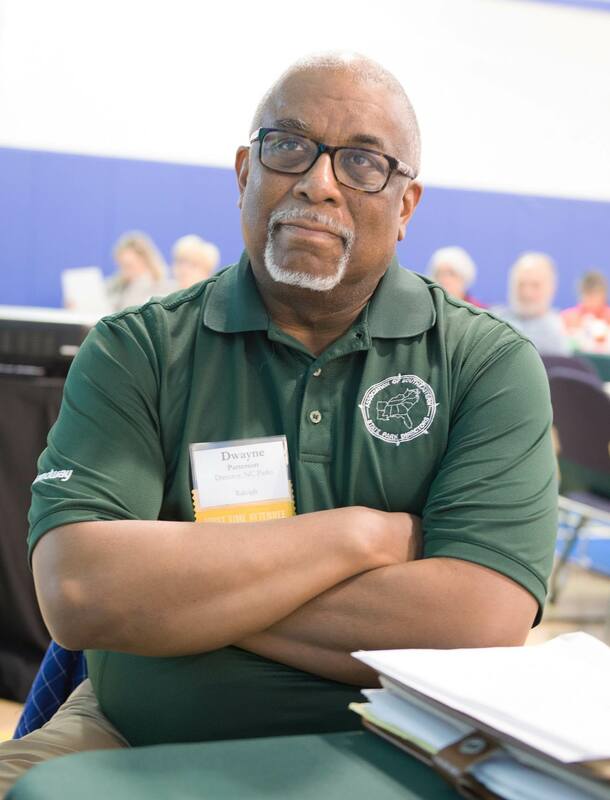 President Bill Scott closed out the “seated portion” of the meeting by challenging us all to bring new friends to the trail, and then bring new Friends to the Gathering next year.We broke into 5 workshops for the afternoon, all well attended. 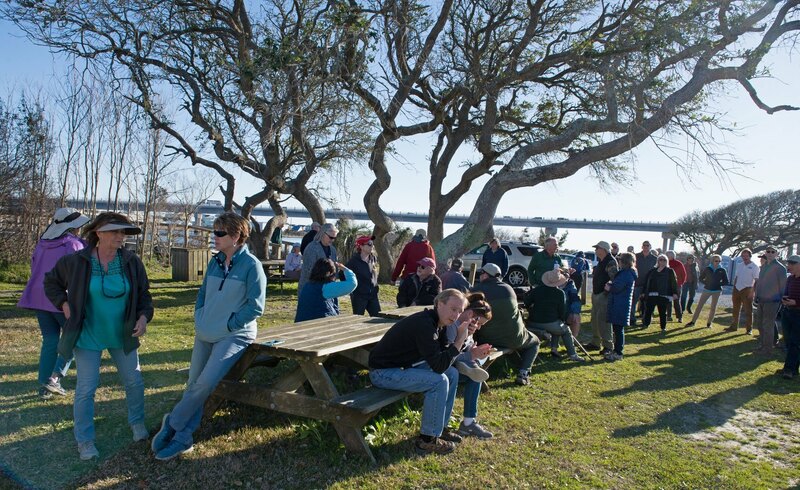 Many folks opted to stay indoors for a more in-depth session with Coastal Crescent Project Manager, Ben Jones. 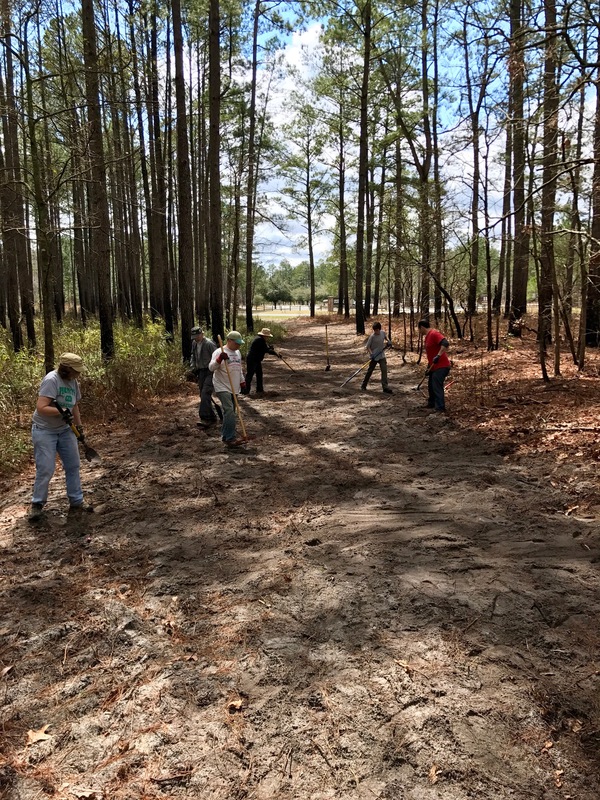 Some met with Surf City staffers to learn how to use GIS mapping on their phones or to help install a trail head on site at the Community Center. Others met with the six “class of 2018” MST completers for a beach hike and a chance to converse about how to plan and complete and MST hike. 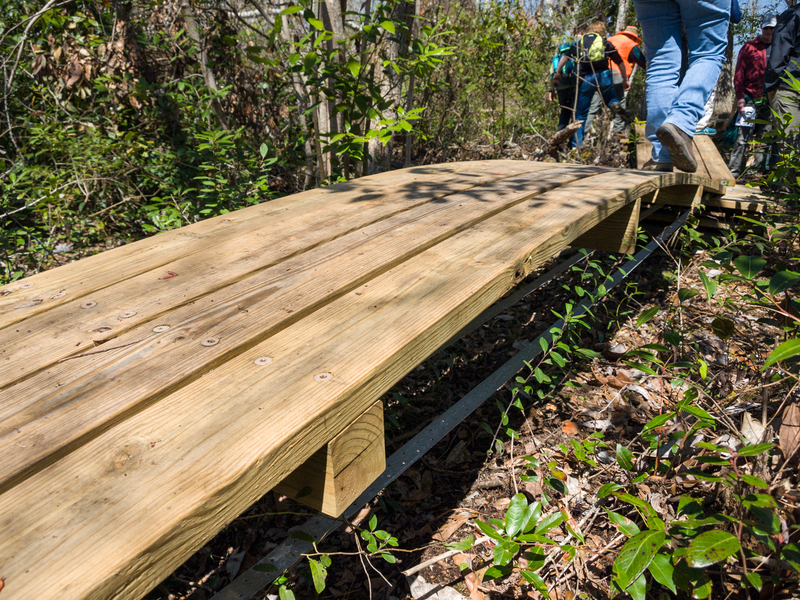 And others opted to drive up to Everett Creek, an NC Coastal Land Trust preserve (which includes campsites for MST hikers), for a nature walk and a chance to help install benches. 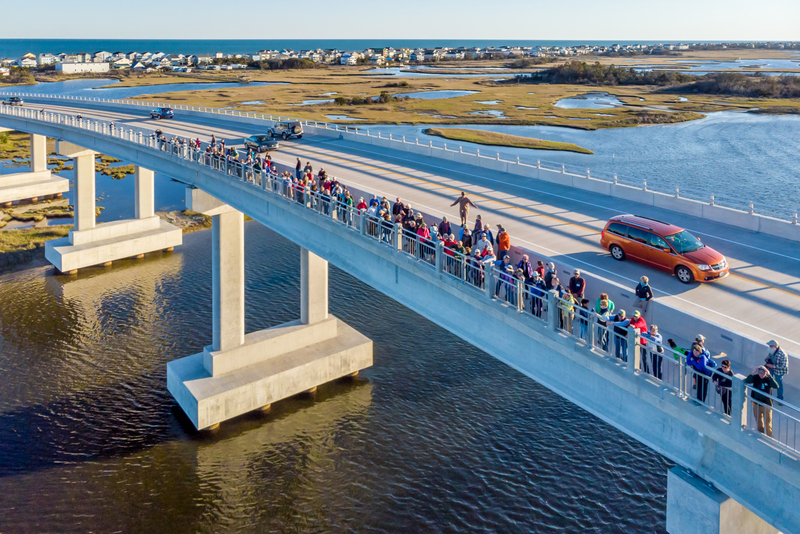 The high point (pun intended) for many was a group hike over the new Surf City Bridge. 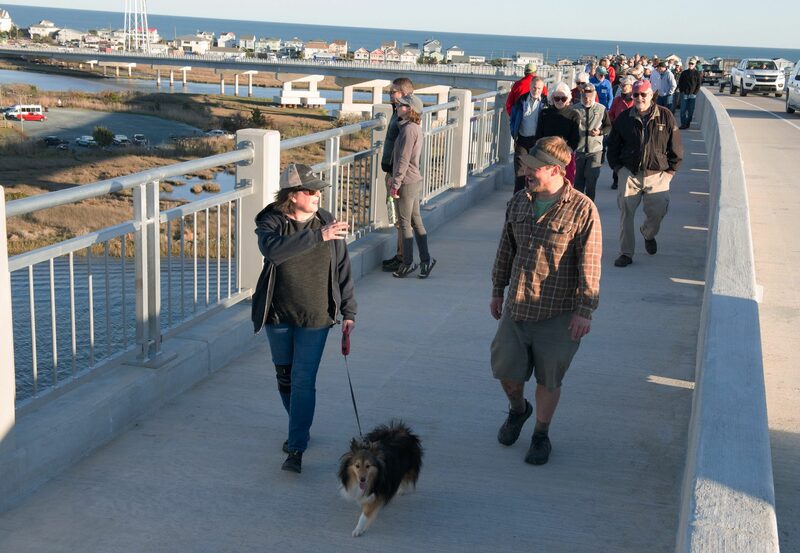 Just this winter, the bridge was opened, replacing a decades old metal swing bridge. We gathered at the foot of the bridge in Soundside Park and then took off. After a quick stop due to confusion about the group photo location, “stop at the top of the big bridge,” we were off again. Friends stretched across the span of the bridge, paused at the top for a group shot taken by drone, and then made it to the far side. Cars happily beeped as they saw our big group of old and new Friends together. 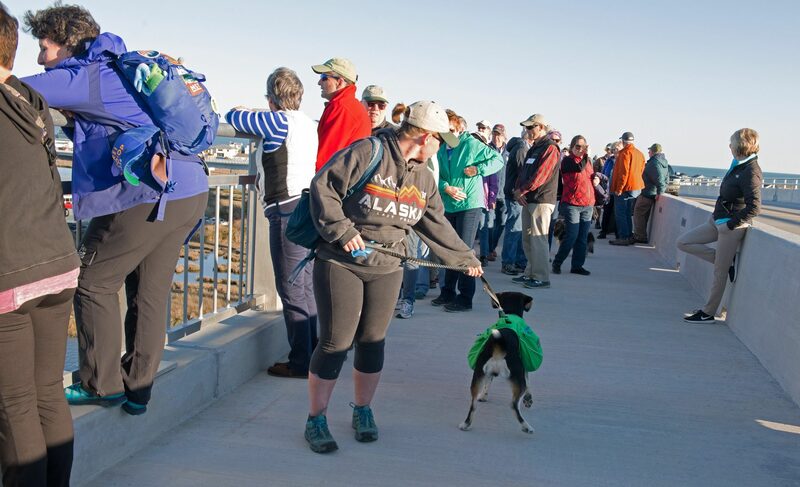 The new bridge has a wide and separate pedestrian lane with a concrete guardrail (which some tested) and will be a great draw for hikers and tourists alike to take in the amazing 360 degree views. 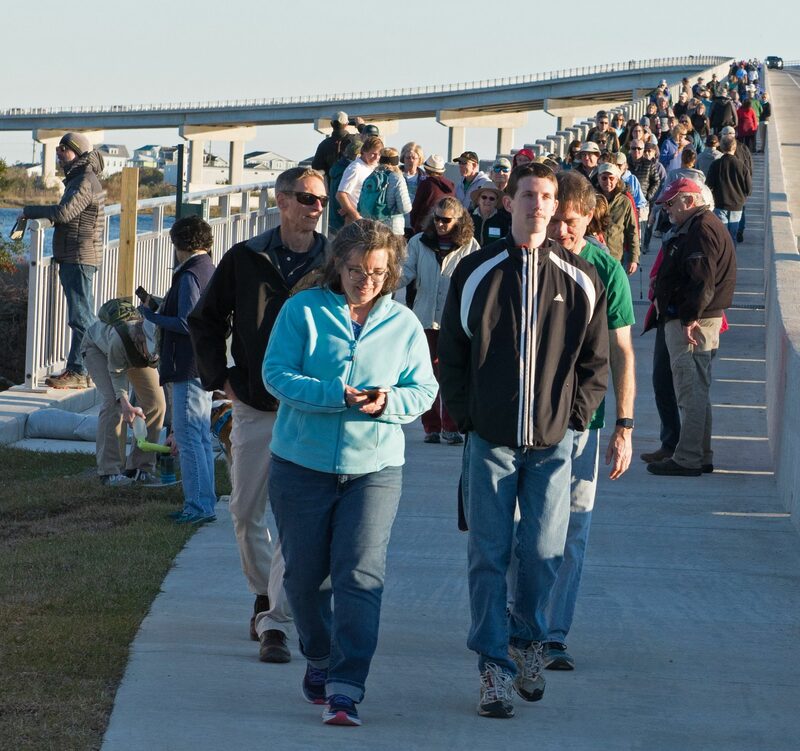 Many Friends lingered near the bridge until sunset, which was simply fabulous that evening. To watch video shot by drone of the hike, click here. Early risers on Sunday were treated to a filling pancake breakfast hosted by Paddle 4 Troops, a local non-profit that helps veterans in a number of practical ways, and then works to get them out on the water. The smell of pancakes and bacon wafted over those who joined Mike Cunningham, a retired minister, for a short yet perfect Sunday service on the beach. 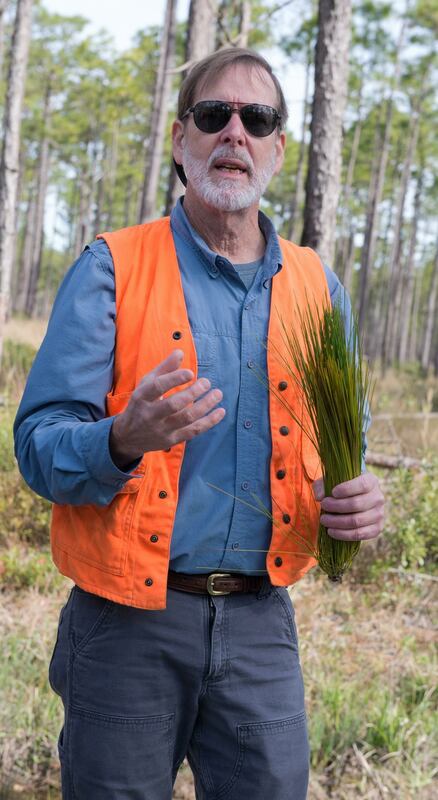 Conservationist Andy Wood then led a large group on a “trek” through Holly Shelter. To cover lots of territory, we formed carpools and drove between special locations, Andy and his son Carson educated us about everything from mosquitos to snakes, from red-cockaded woodpeckers to carnivorous plants. Whew! We, the Friends’ staff and board, who plan and put together the Gathering, always love this weekend! So many great people together in one place, meeting for the first time, or reconnecting after a year apart. 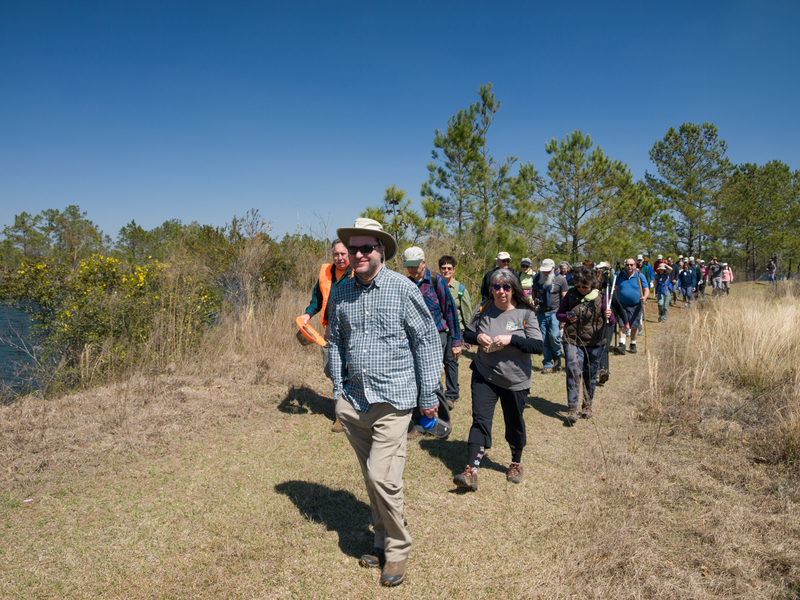 The trail is a path across our state, linking us all together, and for one weekend, it is magical to have the folks who make the trail possible all in one place, together. We’d like to thank our amazing hosts, Pender County Tourism and the Town of Surf City and our sponsors, without whom this weekend wouldn’t happen: Duke Energy, Farm to Feet, AntiGravityGear, Audio Visual Contact, Insect Shield, The Greater Topsail Area Chamber of Commerce and Tourism; and our in-kind sponsors: Daily Grind Coffee, Empire Distributors, Kevin J. McCauley Photographer and Publix. And lastly, thanks to Bill Boyarsky, who took such great shots throughout the weekend. To see all of Bill Boyarsky’s photos, click here. We bet you’ll find yourself a few times. Bill was everywhere! 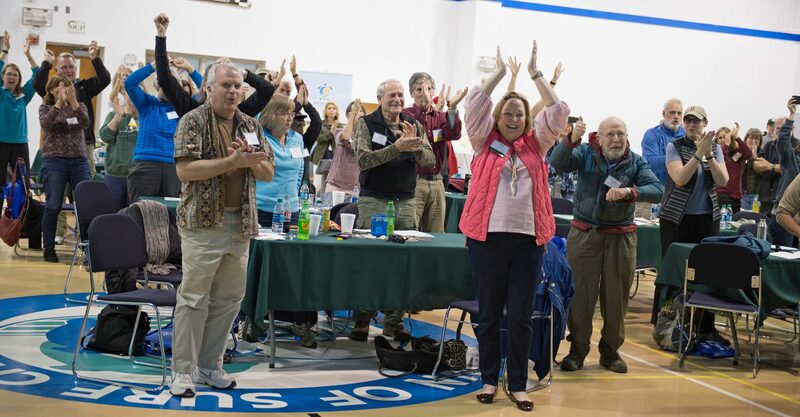 See you back in Surf City, March 27-29 for the 2020 Gathering of Friends!